It’s a sweltering hot day in June and I’m sitting in a small wine bar in Shepherd’s Bush; breathing room only. There’s a buzz in the air as the maximum capacity crowd fidget around the makeshift performance area of two stools and mics. It’s 2pm and Bushstock has been officially open for an hour. This is the first of two surprise gigs that are taking place at the Adeline bar, and even though I know who is performing I can’t help the feeling of anticipation. Bushstock is in its 7th year. It’s a simple premise; a one-day festival held across multi-venues which this year included a church, library, second-hand clothes store, a railway bridge, an early 19th Century dance hall as well as a small handful of regular pubs and wine bars, like the one I am currently squashed into. 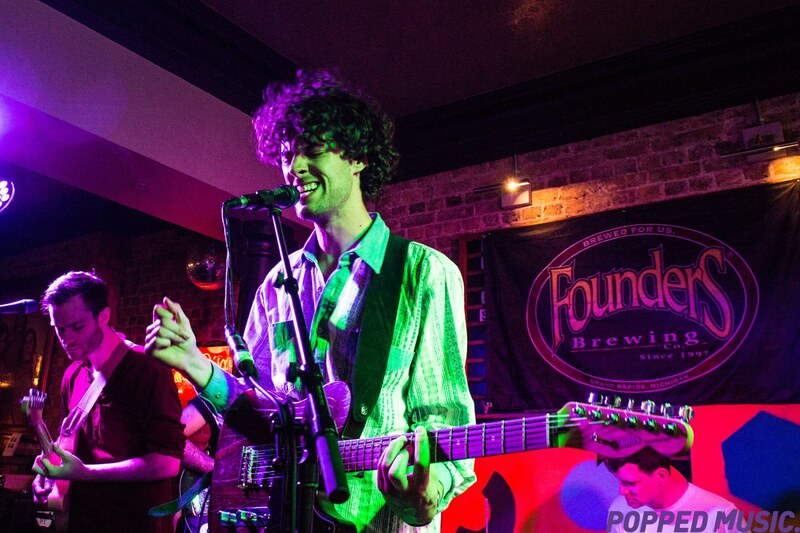 There are many similar festivals across the country; what keeps pulling the punters back to Bushstock every year is the event’s ability to continue to surprise and delight audiences with its sheer breadth of new and established artists. 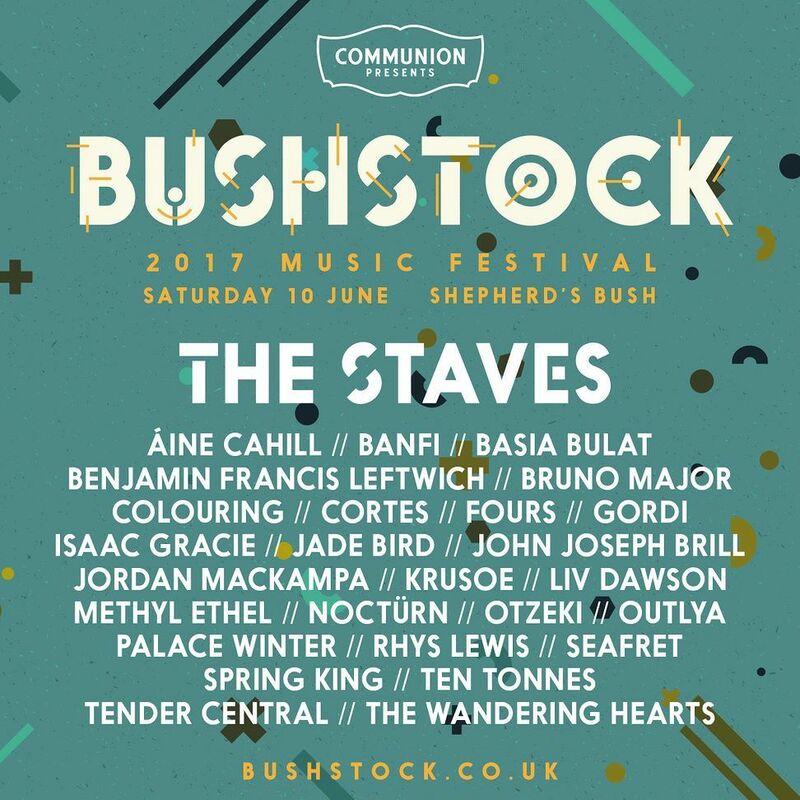 Bushstock has literally made band’s careers. Back to the wine bar and one such act, The Amazons take their seats for a very special acoustic performance of Black Magic. 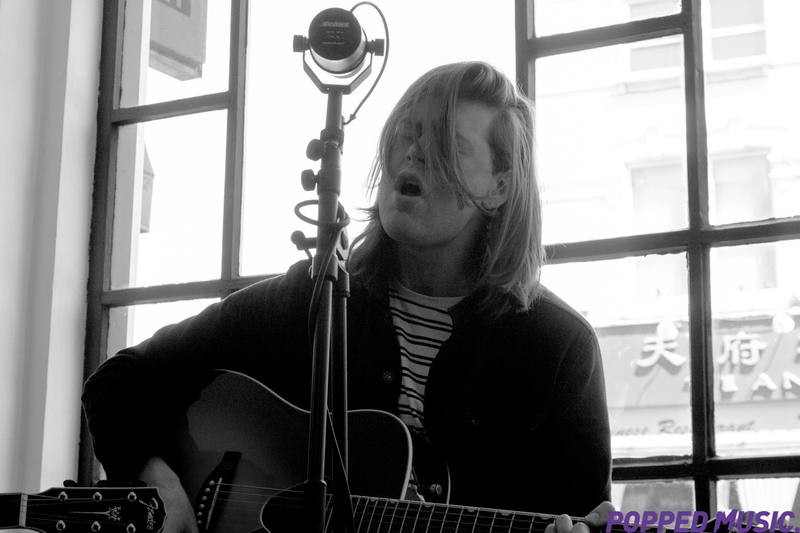 The Amazons first played Bushstock in 2015 alongside Mercury Prize nominee Michael Kiwanuka and The Vaults. It was the gig that landed them a record contract and so the band’s Matt Thomson and Chris Alderton were pretty thrilled to be back in West London where it all began. The set was personal, raw; the unpolished brilliance of musical intimacy. The schedule for Bushstock is pretty hectic. With the afternoon sets only lasting half an hour, some venues a good 10 minutes walk apart and the threat of over-capacity for some performances (St Stephen’s Church was at capacity very early on in the day as people staked their place for The Staves set for example) the day is a little like a military operation. Speaking to people as they piled from one venue to another there appeared to be three distinct approaches to planning the day. I sensibly went for the second option because there were a few new and firm favorite bands I really wanted to catch. The Amazons were the first. Next came Avante Black, a quick skip over the road at Defector’s Weld. 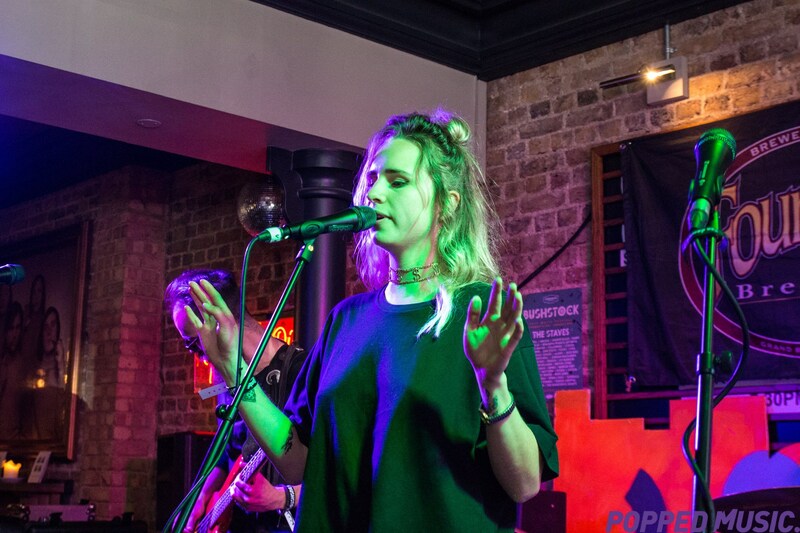 Alt-pop gem Avante Black, aka Ottilia (vocals), Emil (guitar), Dean (drums) and Gabs (bass) wooed the afternoon crowd with a seductive set of smouldering singles forged straight from the fires of the 90’s soft-rock and electronic era – think Pet Shop Boys versus the Sneaker Pimps. For a more modern comparison, it is hard not to bring to mind, when you see Ottilia with her stunning looks, sultry vocals and hard-edged delivery, a time when Gwen Stefani bought sweat and tears to the stage as front-woman of No Doubt. It’s hard to impress in just 30 mins but as the growing crowd testified, not impossible. The joy of an urban festival is that in between the music there’s a great choice of food and drink. Walking down the boulevard, with every corner of the world represented gastronomically, it felt less like Shepherd’s Bush and more like São Paulo, only with a smattering of performers either dicing death with the traffic or mundanely loading sound gear into the back of their over-parked cars. You don’t get that in a muddy field! After a bite to eat it was back to Defector’s Weld for THØSS. Now I don’t want to get too girly here but it would be fair to say I have a huge, loud and very vocalized crush on THØSS. Not just because the singer/songwriter has all the charisma, charm and talent of a young Tom Jones (minus the flinging of oversized knickers); because together with his four-piece band, THØSS has a sound that you can’t help but fall in love with. Wandering from indie to jazz and back again with point-perfect harmonies there really isn’t much not to like. THØSS even managed a few cheeky pouts for the camera – the song might suggest work is a four-letter word but really these guys were having far too much fun. Having regained my composure I headed to the Sindercombe Social for a quick chat with Popped Music favorites, Island and an effervescent performance by Superglu; Ben Brown (vocals and guitar), Krista Lynch (bass and vocals), Alex Brown (guitar and vocals) and Ben Ward (drums and vocals), four friends from Essex. Superglu managed to mix riotous noise with good natured humour to bring an endearing charm to what was otherwise a full on 40 minutes rock-romp. For no other reason than I wanted to know how the acoustics would work in a secondhand clothes store, the next stop on my whistle-stop musical tour was TRAID to catch Banfi and drink warm lager. Textile Recycling for International Development (TRAID) is a charity working to clean up the fashion industry by recycling, reusing and reducing the environmental and social impact of unwanted clothes. Today however the clothes were pushed back to make way for yet another makeshift stage and two pop-up bars. The space was again packed and the air thick. Still Banfi, the three lads currently based in nearby Leytonstone, managed to knock out a solid set despite the increasing heat and slick sweat pooling the stage. 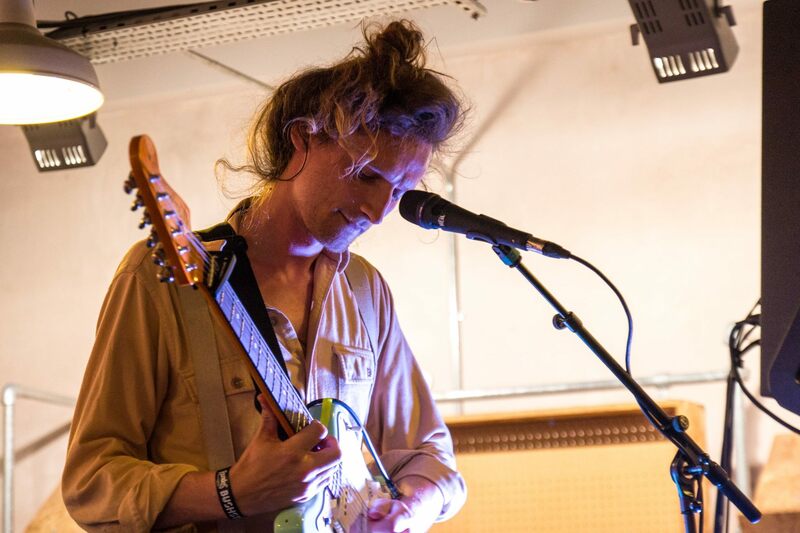 Like many of the festival’s DIY venues, the space was as much a part of the experience as the music itself and Banfi exploited this with another special up close and personal performance. As the queue for The Staves continued to grow outside the now bulging St Stephen’s Church, I skipped passed with smug glee and headed for Bush Hall for in my opinion, the performance of the day. Bush Hall looks like a formal room straight out of a Jane Austen novel complete with cut glass chandeliers and elaborately ornamented ceiling; the ubiquitous smoke machine a more modern addition. The stage and atmosphere was being set for The Big Moon, four girls that are literally taking the music industry by the throat in 2017 having not only released their own debut album Love In The 4th Dimension but also providing backing to Marika Hackman for her wonderfully ironic new album, I’m Not Your Man. As expected The Big Moon stormed on stage and performed an hour of energetic, frenzied and down-right explosive indie-rock songs including an electric version of Madonna‘s Beautiful Stranger rendered in their own down to earth, belting it out style. 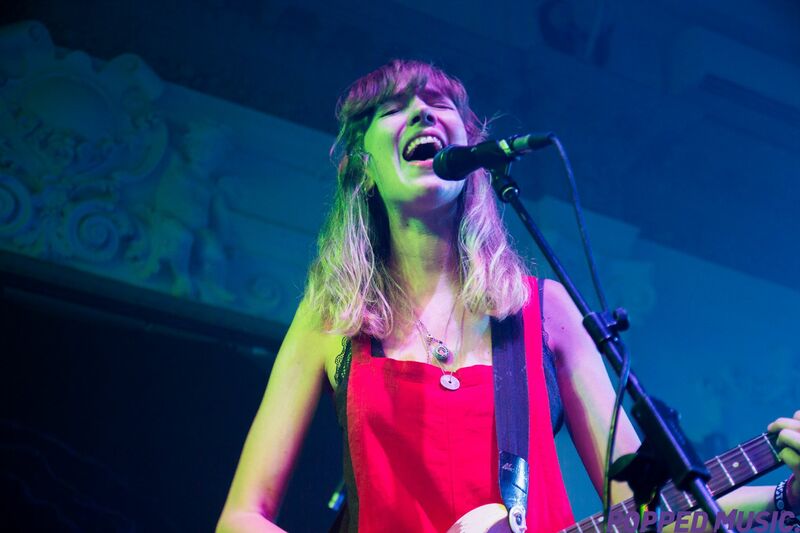 Part of The Big Moon’s charm is that they don’t appear to be performing to us; like the rest of Bushstock we are all part of the musical spell, the magic that has kept audiences enthralled for seven years. Set over and a quick chat with band members Juliette Jackson, Soph Nathann, Celia Archer and Fern Ford and it was back to the tube station with a heavy heart. Where had the day gone? Whilst many headed over to the after party hosted by Otzeki at the Defector’s Weld I could not longer contain the exhaustion built by a day of anticipation, adrenaline and sunshine. Based on my tube ride back and the number of sleeping passengers all bearing wrist bands like some narcoleptic tribe, it appears I wasn’t the only one to be defeated by Bushstock. Sweet dreams weary travellers, until we meet again next year.